Transform an input image/frame (human faces included) into printable ASCII characters using a single decision tree. This demo is tied to the SOD project: An Embedded Computer Vision & Machine Learning Library - sod.pixlab.io. ASCII art is a related (and older) graphic design technique for producing images from printable characters. Divide the input image into rectangular grid of equal size. The grid size correspond to the height and width of a single tile (i.e. font glyph) obtained form the codebook used during the training phase. For each cell, a font glyph is selected from the codebook to replace the raw pixels in this cell. The glyph is obtained by feeding the raw pixels into a decision tree where the output of the tree is the index of the target tile in the codebook. The tree is learned by first converting a large set of images to ASCII art with SSIM index and then using the obtained data as a training set. The C/C++ API documentation, the full source code and the hex output model are available to download from the official PixLab page at https://pixlab.io/art. 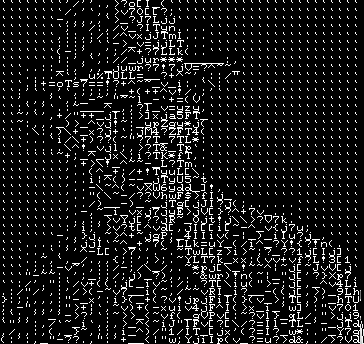 Please report any issue or feature request to the ASCII Art Github repository at https://github.com/symisc/ascii_art. Get Started with the PixLab Machine Vision & Media Processing APIs.